One of the greatest risks your senior faces is the possibility of a fall. These falls can be frightening, but they can also be very dangerous for a senior. 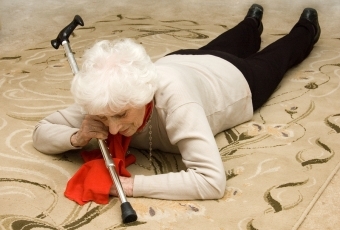 Elderly adults often experience severe injuries as a result of falls, and these injuries can dramatically impact their functioning, health, and quality of life. As a family caregiver, you can make a tremendous difference in your senior's health and safety by helping them to avoid falls. A few simple steps and changes can protect your senior from a fall and keep them safer and healthier as they age in place. Encourage your senior to exercise regularly to keep their body strong and responsive. Flexible, conditioned joints and muscles help with balance and range of motion, while strong bones help prevent serious injuries. Support your senior in eating a healthy, well-balanced diet. Getting the proper nutrients supports better functioning and a stronger body, and can help reduce feelings of dizziness and instability. The same applies to getting hydration they need as well. Ensure your parent's flooring is not too slick, and that there are no tripping or slipping hazards in the way. These can include loose coverings, decorative items, cords, or uneven areas. If these are present, make modifications to create a safer environment. Add extra lighting to their home to make it easier to see potential hazards and avoid them. Consider elder care so your parent has access to physical support and assistance to manage tasks such as bathing, transferring, and getting dressed that might be dangerous. Staying active is an important part of keeping your aging parent healthy throughout their later years, and elder care can make that easier for your parent. Many seniors struggle with physical challenges and other problems that make them more prone to falls, or make staying active difficult. This doesn't mean, however, that they should not enjoy an active and engaged lifestyle. An elder care services provider can help them to stay more active, engaged in more activities and opportunities in the world around them, and enjoy greater independence. Physical support and assistance, transportation to activities, support in making good nutritional choices, and more can help your parent to live a more active and fulfilling life as they age in place. Wherever their home may be, our caregivers can help keep your loved ones safe. Call our local Niagara office at (289) 434-4704 to learn how elder care services can assist your family.